Philadelphia police are looking for a man who flipped a stolen SUV, fled on foot, got tasered by an officer, then stole another car and escaped. It happened early this morning in Spring Garden after police ran the tags on the SUV and tried to pull it over. After the driver was tased, he stole the car of someone who pulled over to help. A water leak at Center City One condos on the 1300 block of Spruce Street in Philadelphia forced more than 200 people to be evacuated. A standpipe broke on the 28th floor and also caused a gas leak. No word yet on how long repairs will take. Two people have surrendered to police in connection with the accidental shooting of 12 year old Tahtiana Diggs in Darby yesterday. She was shot in the hip when an argument between neighbors erupted into gunfire. Joshua Singleton and Lynette Crawford are being held and a third person is being sought. New Jersey Governor Chris Christie is upset the Philadelphia Daily News headline calling Atlantic City a "Tourist Death Trap." The headline refers to the murder this week of a mother and daughter from Canada. Christie says no matter how much security is in place, random acts of violence happen. No charges will be filed in the case of the boy stuck in the washing machine, but the woman in the video is a babysitter and the man is a boyfriend. The child's mom was at work when the incident happened and had no idea what happened until she saw the viral video. It was a game of peek-a-boo gone wrong. In a Camden County Laundromat, a dad stuffed a 1 year old in a washing machine, closed the door and dizzying mayhem followed. The child was locked in as the machine spun and filled with water. The entire incident was captured on video. A worker cut the power and removed the child unharmed. Philadelphia, PA - May 21, 2012. Indie Rock and Indie Folk fans in Philadelphia have plenty of reasons to stay in the city this Memorial Day Weekend. 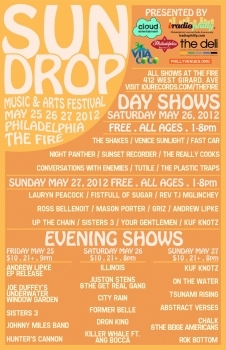 iRadioPhilly and The Fire have teamed to present Philadelphia's second annual Sundrop Music and Arts Festival. The weekend-long event will feature three days and two nights of the best multi genre music Philadelphia has to offer. Two fires in Frankford have Philadelphia police looking for as arsonist. The two fires were a block apart over the weekend in abandoned buildings. Neighbors had to be evacuated as firefighters doused the 2 alarm blazes. Facebook launched their Initial Public Offering on Wall Street's NASDAQ this morning. The biggest tech stock ever opened at $38 share valuing the company at $104 billion. Facebook is the hottest IPO since Google in 2004. Residents of the Washington Tower Apartments in Fort Washington have been told that the building has been condemned by Washington Township. About 80 families were given 2 days notice of the eviction and have to move out by 1 pm today.